The 'Seven Sisters of Postcard Row', also known as the 'Painted Ladies', Victorian style houses at Alamo Square in Haight-Ashbury District, San Francisco, CA, USA with the city skyline in the background on a colourful pink sunset. This row has become (along with the Golden Gate Bridge and Alcatraz) synonymous with San Francisco. This image belongs to the travel and nature stock photo library. This stock photo of The Painted Ladies at Dusk is available for licensing for commercial and editorial uses including websites, blogs, books, magazines, brochures and advertising. Restrictions may apply for images which contain third party copyrighted material or sensitive subjects. Photos of artwork are for editorial use only. 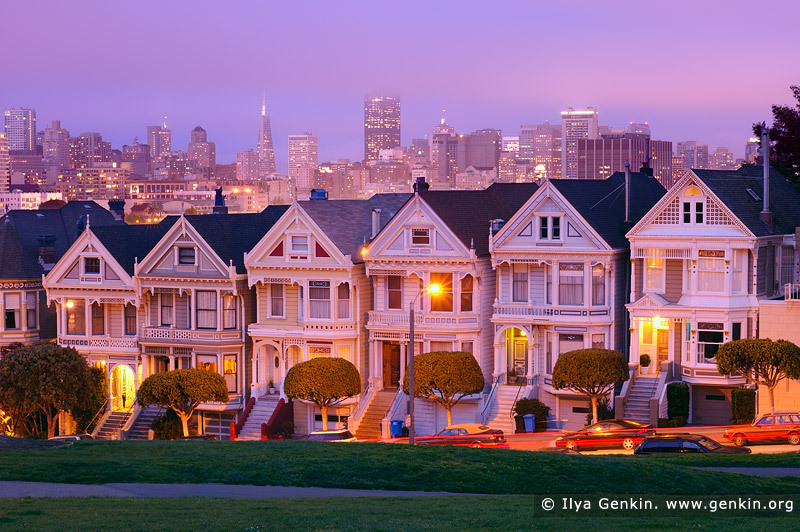 This image id US-SAN-FRANCISCO-PAINTED-LADIES-0001 of The Painted Ladies at Dusk, is copyrighted © by Ilya Genkin. This is not a public domain image.